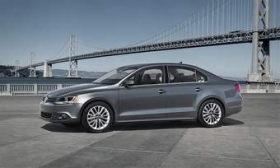 NEW YORK (Bloomberg) -- Volkswagen AG said it will cut the price and increase the size of the Jetta compact car, its best- selling model in the U.S., as the automaker seeks to almost double sales in the market by 2012. The revamped Jetta will be about 3.5 inches (90mm) longer and priced about $1,700 less than the current version when sales start in October, VW said. Volkswagen, Europe's largest automaker, is shifting more production to North America to help trim costs and compete with small-car leaders Toyota Motor Corp. and Honda Motor Co., said Stefan Jacoby, chief executive officer of its U.S. unit. The company is aiming for 400,000 U.S. sales for its namesake brand by 2012, compared with 213,454 last year. “Model by model, our lineup will be competitively priced so that we will be able to compete in the American market with our products,” Jacoby said yesterday at a press briefing to introduce the car in New York. Moving more production to North America from Europe provides Volkswagen with a hedge against currency fluctuations and shaves costs, Jacoby said. He restated the company's goal for North American output to rise to 75 percent of sales in the region by 2013, from about 60 percent last year. Volkswagen will be completely independent of the euro- dollar exchange rate by 2012 or 2013, and the U.S. business will be profitable by then, Jacoby said. The company, which reported a profit of 960 million euros ($1.17 billion) last year, does not break out its results for the U.S., and Jacoby declined to give specifics for how much the business lost in the market last year. Volkswagen plans to sell the 2011 Jetta for about $16,000, down from the current base of $17,735. That would bring it closer to the starting prices of Toyota's Corolla and Honda's Civic, now $15,450 and $15,455, respectively, according to the companies' Web sites. “They're going after big-volume products,” said Jeff Schuster, executive director of global forecasting at market- research firm J.D. Power & Associates in Troy, Michigan, in a telephone interview. Volkswagen reported U.S. sales of 46,173 Jetta sedans and wagons this year through May, a 27 percent increase from a year earlier. In the same period, sales rose 17 percent to 118,625 for the Corolla and 9.9 percent to 107,127 for the Civic. Volkswagen is scheduled to open a plant next year in Chattanooga, Tennessee, that will build a new midsize sedan the company expects to name by early next year. The Jetta is produced in Puebla, Mexico. J.D. Power is “fairly bullish” on Volkswagen's U.S. sales prospects, while setting its own estimate short of the company's 2012 goal, Schuster said.